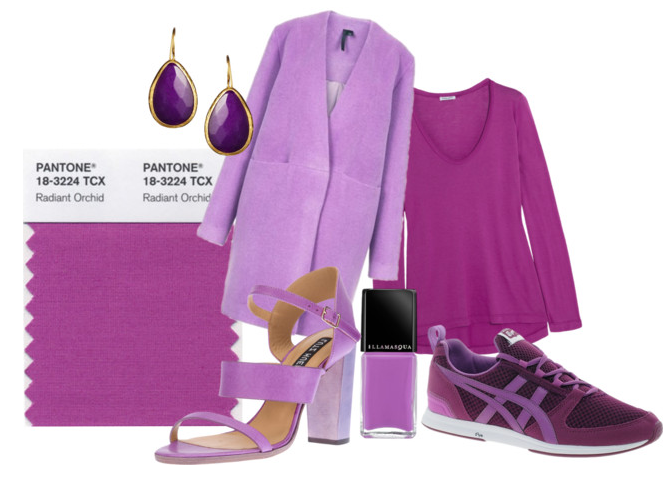 The Pantone Color Of The Year 2014: Radiant Orchid ~ Caviar Taste, Tuna Fish Wallet. Say goodbye to Emerald Green, and hello to Radiant Orchid! Every December, Pantone introduces the new "it" color for the year ahead. This year's hue, Radiant Orchid, is a lovely change of pace compared to it's predecessors. Radiant Orchid radiates great joy, love and health. With an alluring mix of fuchsia, purple and pink undertones, there's so many way to sport the shade. Expect to see this hue everywhere in the coming year. And I mean everywhere! You don't have to wait until 2014 to make your Radiant Orchid debut. Here are a few of my favorite pieces to shop & wear now. Wow, what a gorgeous selection!! The color palette is absolutely beautiful. Looking forward to seeing more of this color come the new year!!! That coat! So pretty, I love this shade because it looks like it will flatter pretty much everyone.